Most visitors to Zambia come between June and October, when the land is drying out after the rains and animals are seeking out water, but the ‘emerald’ season, during the rains, can be great for birders and photographers. For more details, see Zambia’s climate statistics. The distances between Zambia's safari areas and national parks are huge and its roads are often poor, so on virtually all of our trips you will fly between the parks in light aircraft. Most flights run to fixed schedules, although if you travel away from the main parks, then we'll often charter small planes. When moving from one camp to another in the same national park, you’ll often be transferred by 4WD – which effectively becomes an extra game drive. In some specialist walking camps in the South Luangwa, you may even be able to walk between the camps. Most safaris to Zambia are tailormade. Browse our extensive list of safari ideas, then ask the team at Expert Africa to help you put together an itinerary that will suit your requirements. If you prefer to travel in the company of a small group of like-minded travellers on a safari led by a professional guide, our Wild about Africa programme has a small range of the best of these trips in Zambia, and some extensive choices in other countries also. Top of the bill for a safari in Zambia is South Luangwa National Park, which offers superb big-game safaris by 4WD, plus some of Africa's best walking safaris. Most people spend at least five to seven days of their Zambia safari here, in at least two camps. Do think about enjoying at least one of the Luangwa's tiny bushcamps: they’re very special. Justifying double billing, the Lower Zambezi National Park offers big game beside the big, languid Zambezi River, often with a beautiful mountain backdrop. As well as night and day drives, come for boat trips, canoeing, great fishing and walking safaris, all based at intimate safari camps perched along the riverbank. Higher, cooler and less developed than either the Lower Zambezi or the Luangwa, Kafue National Park has species like cheetah that are rare elsewhere in Zambia. Kafue's Busanga Plains are the gem of the park, so do include that in any trip to this national park. For a very adventurous element to a Zambian safari, consider North Luangwa National Park, the more remote sibling of South Luangwa. North Luangwa is one of Zambia's great destinations for experienced safari addicts, with just a couple of tiny bushcamps that focus almost exclusively on walking safaris. For the serious wildlife enthusiast, head to Shoebill Island Camp in the Bangweulu Wetlands in search of the prehistoric-looking shoebill, or earmark Kasanka National Park for the mass migration of fruit bats that materialises each November. Further off the beaten track again is the rarely visited Liuwa Plain National Park, a vast, grass-covered plain in the extreme west. We can organise fly-in trips in November and December to witness huge gatherings of blue wildebeest, and during May and June, when the birdlife – including huge flocks of crowned cranes and pink pelicans – is at its most stunning. Although not explicitly a safari destination, you’ll still find plenty of wildlife at Shiwa Ng’andu, effectively an English manor house in the bush. Guests often return wishing they had had longer to explore the house, the farm, the lake and the extensive estate – whether on foot, by 4WD or on horseback. Shiwa makes a natural add-on to any trip to Kasanka National Park or the Bangweulu Wetlands, and is easily linked to a safari in the North or South Luangwa national parks. No trip to Zambia would be complete without experiencing the majesty of the Victoria Falls, one of the wonders of the world. You'll find good-value hotels nearby, a handful of lovely lodges on the banks of the Zambezi, and a host of adrenalin activities. The Falls lie in the far south of Zambia, close to the town of Livingstone, but are easily added on to any trip to the country (or indeed to nearby Botswana). One of the joys of a Zambia safari is that you'll stay in small safari camps that will tailor their activities around your interests. Most safari camps in Zambia organise two activities per day: one in the morning, the other in the evening, each lasting about three or four hours. Your days will be fairly full, but there are always a few hours after lunch for a light siesta – after all, it is a holiday! Most safari camps in Zambia offer a range of activities. Typically you’ll spend your days (and evenings – something that is not possible in national parks in many countries) exploring either from open-topped 4WD game vehicles, affording all-round visibility, or on foot. Zambian safari guides are trained to very high standards, including stringent practical tests, which will add enormously to your safari experience. 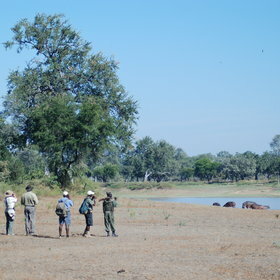 Walking safaris can also be done in the company of a small group. See our Robin Pope Walking Safaris for departure dates and prices. What are Zambia's walking safaris like? If you have only seen animals from a vehicle and longed to get out, then walking with big game is an amazing experience; it's exhilarating to the point of addiction. Zambia's safari camps differ, but usually you'll set off on a walk with a guide, an armed game scout, and often a tea-bearer carrying refreshments. Walks have a maximum of seven guests, but two to five is more usual. You don't need to be especially fit for a Zambia walking safari: these aren't route marches or endurance tests. Instead they're about taking time to spot the signs of the wildlife and learn how the ecosystems work. The distances covered depend on the wildlife that you find and the interests of the walkers, but two to five miles (3–8km) would be typical. You'll stop frequently for your guide to educate, enlighten and often entertain you with tales of the bush around you. On a Zambia walking safari in, the ground underfoot is always uneven, so sensible shoes or light boots are ideal. You need to carry your camera and binoculars, and ideally you should wear natural, muted colours and a hat. Most of Zambia’s safari camps are based in and around the country’s national parks, rather than in private concessions. Typically these camps are small and quite intimate, sometimes with just three or four guest rooms; large safari hotels are not the norm in Zambia. Many camps are still owner run and hosted by dedicated people with in-depth knowledge of the bush, thus considerably enhancing your safari experience. Almost all safari camps have en-suite rooms or tents, most with flushing toilets and running water. The simplest may be constructed largely of reeds; others will be tented in concept, while in some you’ll find permanent structures of wood or stone, with glazed windows. Yet wherever you are, standards are generally very high – so even where mod cons are apparently lacking, you’ll still have hot water on call and exceptionally well-designed toilet facilities! When David Livingstone chanced upon the Victoria Falls in 1855, he brought the country that is now Zambia to the attention of the world, but it was the ambitions of Cecil Rhodes that led to the creation of a British colony: Northern Rhodesia. In its wake, this annexation brought taxation and hardship to the local people, drawn together from diverse cultural backgrounds. Many had little choice but to work in the mines, where conditions were by all accounts appalling. By independence in 1964, the new Zambia was crippled with debt, and despite the country’s considerable mineral wealth, poverty and lack of education are still major challenges for the government. Geographically, Zambia is dominated by a high, undulating plateau, deeply incised by the great valleys of the Zambezi, Kafue, Luangwa and Luapula rivers, which in turn form the backbone of the country’s flagship national parks. While tourism in much of Zambia is still only in its infancy, these parks – and their international visitors – bring both employment and an income to the local people, and a solid reason for the conservation of wildlife.